Christie's auction house did not immediately identify the absentee buyer of the sunburst Fender Stratocaster. The instrument went for the highest price ever paid for a guitar at auction, Christie's said. 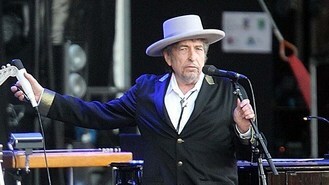 The festival performance cemented Dylan's move from acoustic folk to electric rock 'n' roll. Now viewed as a defining moment that irrevocably changed American music, the raucous, three-song electric set at the Rhode Island festival was met with boos from some in the crowd, and folk purists saw Dylan as a traitor and a sell-out. The presale estimate by Christie's for the guitar, which was sold with its original black leather strap and Fender hard shell case, was 300,000 to 500,000 dollars. The previous record for a guitar sold at auction was held by Eric Clapton's Fender, nicknamed "Blackie", which sold at Christie's for 959,500 dollars (£588,000) in 2004. With a classic sunburst finish and original flat-wound strings, Dylan's guitar had been in the possession of a New Jersey family for nearly 50 years. Dylan left it on a private plane. The pilot's daughter, Dawn Peterson of Morris County, NJ, said that her father asked Dylan's management company what to do with the guitar but nobody ever got back to him. Last year, she took it to the PBS show History Detectives to have it authenticated, and experts matched the wood grain on the instrument to close-up colour photos of the guitar taken at the 1965 festival. Dylan's "going electric changed the structure of folk music", said Newport Folk Festival founder George Wein, 88. "The minute Dylan went electric, all these young people said, 'Bobby's going electric. We're going electric, too'." Christie's was also offering five lots of hand- and typewritten lyric fragments found inside the guitar case - early versions of some of Dylan's songs. They had a presale estimate ranging from 3,000 to 30,000 dollars. The lyrics included an early draft of Absolutely Sweet Marie from Dylan's Blonde On Blonde album, and three songs from the record's 1965 recording session that weren't released until the 1980s. Among them was I Wanna Be Your Lover.